The CDC has just updated its investigation into the Salmonella Braenderup outbreak associated with Mangoes imported from Mexico. 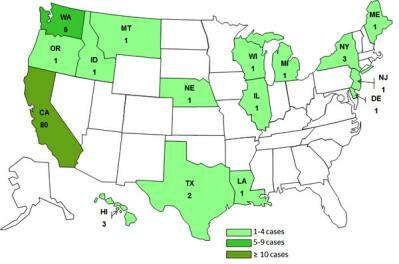 Now 105 people in 16 states have been sickened with the outbreak strain of the bacteria. The number of ill persons in each state is: California (80), Delaware (1), Hawaii (3), Idaho (1), Illinois (1), Louisiana (1), Maine (1), Michigan (1), Montana (1), Nebraska (1), New Jersey (1), New York (3), Oregon (1), Texas (2), Washington (6), and Wisconsin (1). Twenty-five patients have been hospitalized. No deaths have been reported. The investigation by public health officials indicates mangoes are a likely source of this outbreak. The Canadian Food Inspection Agency (CFIA) issued a health alert about the Daniella brand of mangoes imported from Mexico on August 24, 2012 and has expanded it several times. On August 29, Splendid Products of California recalled some lots of the Daniella mangoes because they may be contaminated with Salmonella. The recalled mangoes can be identified with the Daniella brand sticker and one of these PLU numbers: 3114, 4051, 4311, 4584, or 4959. The mangoes were sold in the U.S. and in Canada between July 12, 2012 and August 29, 2012. The mangoes may have been sold at Aldi, Amigos, BI-LO, Copps, Costco, El Super, Food 4 Less, Giant Food, Kroger, LLC, Mariano’s, Market Street, Martin’s Food Market, Metro Market, Pick ‘n Save, Rainbow, Ralph’s, Roundy’s, Savemart, Stop & Shop, TOP Food & Drug, Topco, WalMart, and Whole Foods. Among persons who have been interviewed, illness onset dates range from July 3, 2012 to August 11, 2012. The age range is from less than 1 year to 86 years, with a median age of 30. Fifty-four percent of ill persons are female. Symptoms of Salmonella infection include diarrhea, fever, severe abdominal cramps, nausea, and vomiting. If anyone is exhibiting these symptoms, contact your healthcare provider. If you are not sure if the mangoes you have purchased are part of the recall, ask your retailer about it. If they don’t tell you or if you are unsure, throw them out. Public health officials are still investigating to see if any other food sources may be causing this outbreak.